This new collection presents a rich selection of innovative scholarship on the Etruscans, a vibrant, independent people whose distinct civilization flourished in central Italy for most of the first millennium BCE and whose artistic, social and cultural traditions helped shape the ancient Mediterranean, European, and Classical worlds. Sinclair Bell is Associate Professor of Art History at Northern Illinois University. He is the co-editor of five other books, including New Perspectives on Etruria and Early Rome (2009 with H. Nagy), and is currently the reviews editor of Etruscan Studies: Journal of the Etruscan Foundation. Alexandra A. Carpino is Professor of Art History and Department Chair of Comparative Cultural Studies at Northern Arizona University. The author of Discs of Splendor: The Relief Mirrors of the Etruscans (2003) and several articles on Etruscan portraiture and mirror iconography, Dr. Carpino also served as editor-in-chief of Etruscan Studies: Journal of the Etruscan Foundation from 2012 to 2014. 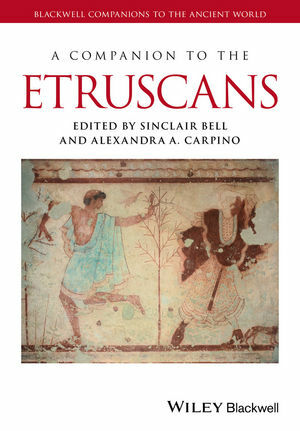 "As a whole, A Companion to the Etruscans presents a well-assembled and well-edited collection of essays on the current state of research in Etruscan studies. Ungraduates, graduate students, and specialists alike will find it to be an important resource ... institutional libraries will want this indispensable English-language guide on the shelves."